The location is in Rockville MD. The "Take It!" came from the fact that it was the first time I had seen the shrubs illuminated. The other many times I had been by the store at that time these lights were not on. It almost startled me. 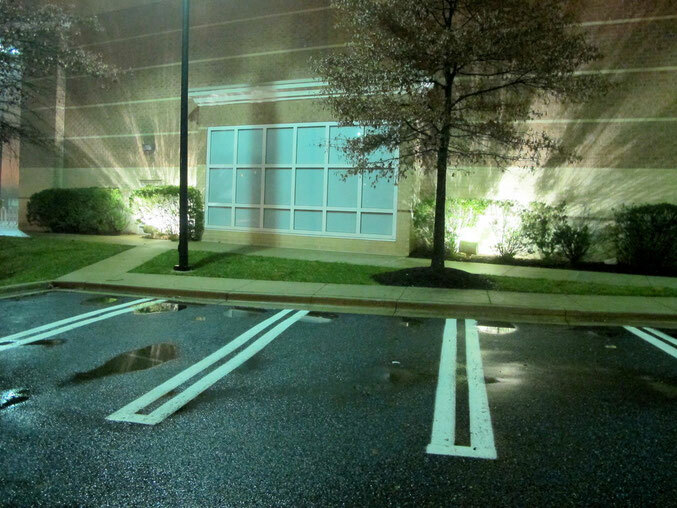 I was immediately drawn in to the parking area adjacent to the lit wall. I parked and got out of my car with my camera, quite dazzled. The configuration of the windows and frames on the wall that are bordered by these extra bright lights gave it a near shrine appearance. The parking space was included in the photo as it seemed to invite one to visit and gave convenient access. I walked around the area taking a number of shots. It was as if I was waiting for some mystic to appear and tell me to ask any question I might have, for the answer would be given (almost sounds like the new Iphone). The After Take: The lights have been on several times since that early morning, and each time I pass by, I am tempted to pull in to chance upon a possible medium. Everyone I have shown this picture to has a full on reaction, mostly a sort of shock that such a place would exist. I cannot help but think the people who run the store have no idea of how spooky this site is. As you may have gathered, my regular work has me out and about before dawn. It affords me many viewings that later in the day are obscured by busy traffic, or odd as it may sound, are obliterated by the light brought on by the day. I keep thinking of what question I would ask if I found someone there. Thanks for joining in the muse. This is truly a great photo. The lighting here is intense.